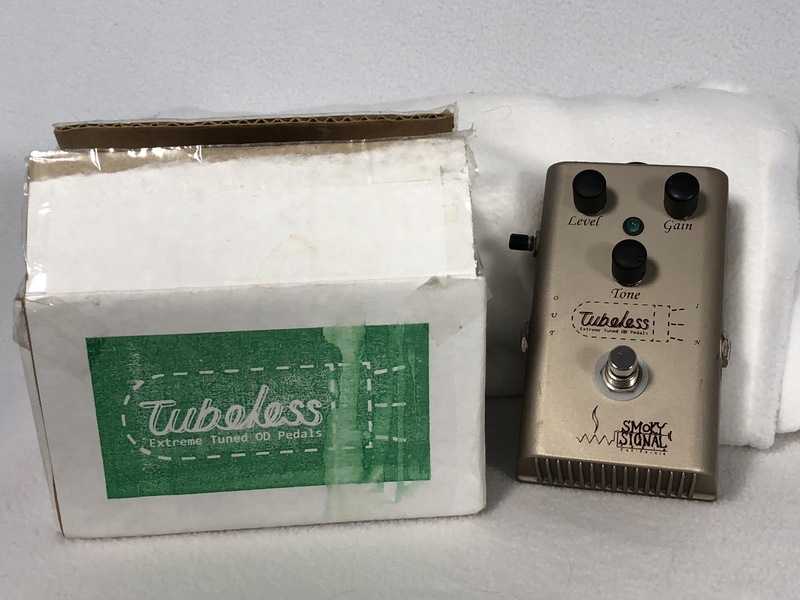 You like Trussarts?….well step aside James T because there is a better alternative available….less expensive….top quality parts….hand crafted…..sound better…play better….and UNIQUE looking. 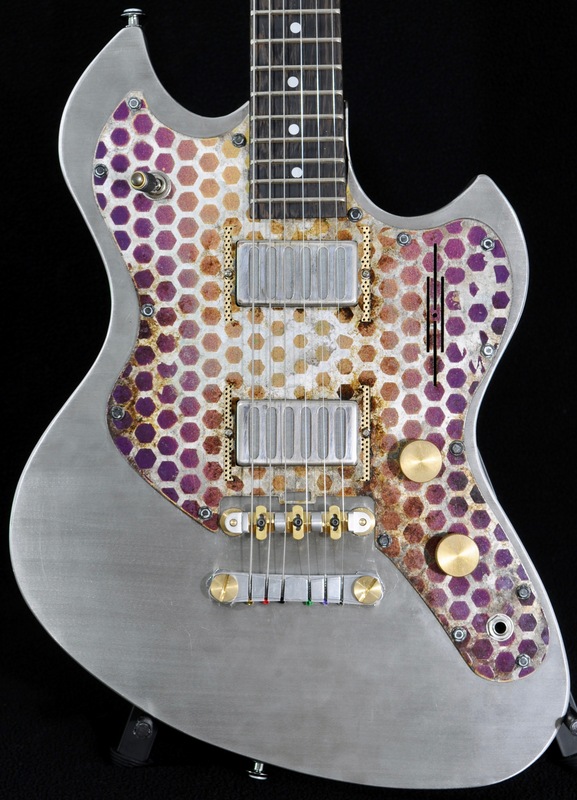 Enter HYSTERIA GUITARS. Master crafted from top grade Aluminum. 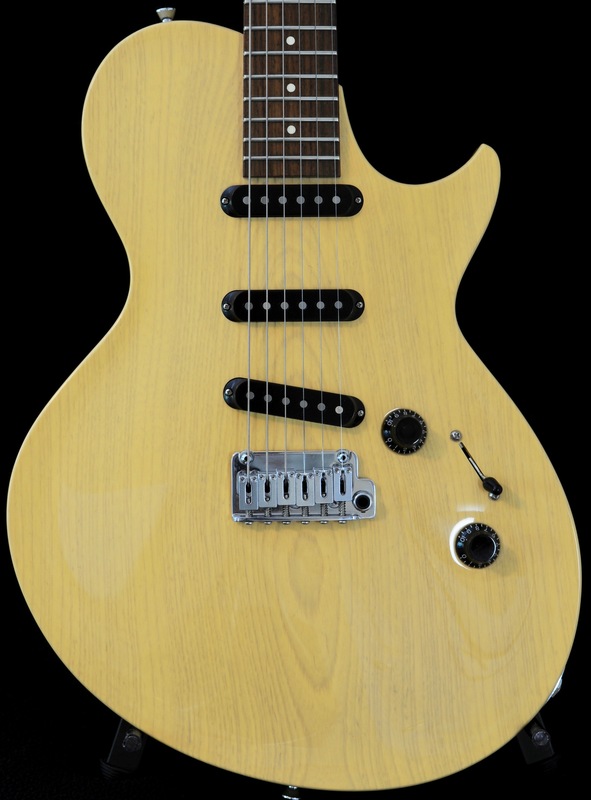 Look at the craftsmanship and artistry….see those KNOBS & SWITCHES…no off the shelf Chinese plastic crap……pickups?…Lollar Raw Power. Tuners…Hipshot Locking. 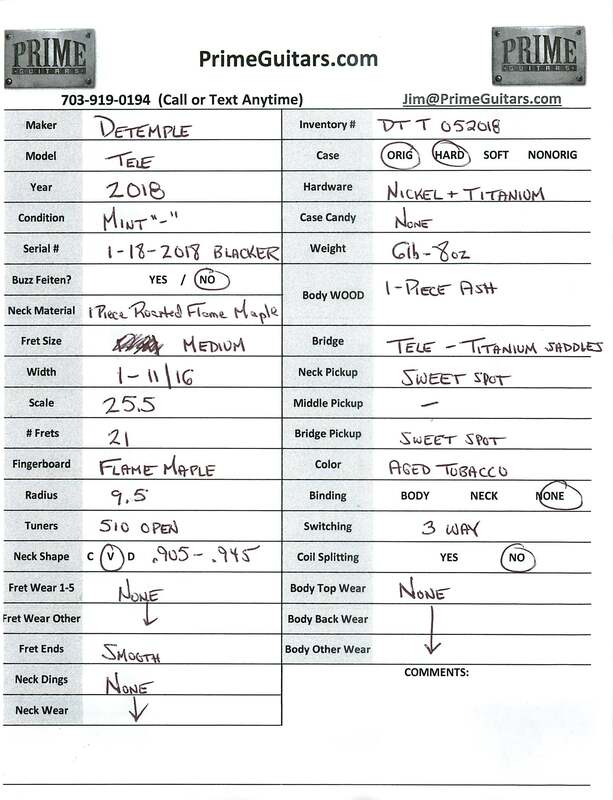 Weight?….just 8lb-4oz….yup….the perfect storm. Neck is a wonderful Maple w Rosewood Board & 1.64″ Width. 25.5″ Scale and 12″ Radius. The “C” Profile Neck is .895″-.98″. Custom bridge and unique styling make this a MUST have for anyone who wants to make a statement. Playability is fantastic. Just easy and fun. The neck vibrates and the notes ring long and fat. Just a wonderful organic tone full of air and fatness. Why mess around with stamped out junk when you can get something unique and handcrafted that has world class tone? 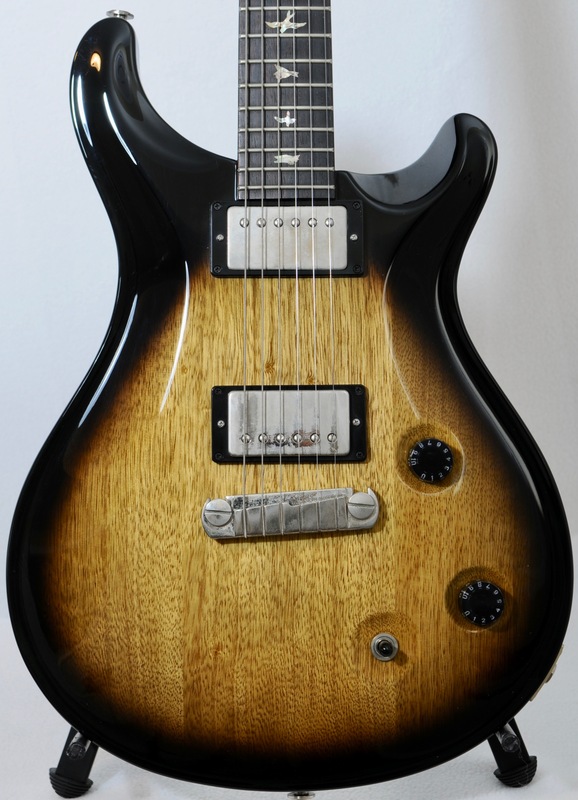 Extremely Limited Edition PRS McCarty with a BRAZILIAN ROSEWOOD Board. Korina Body & Neck too! Because of the rare wood used, this model was specifically labeled (see back of headstock) as for sale in U.S. Only. 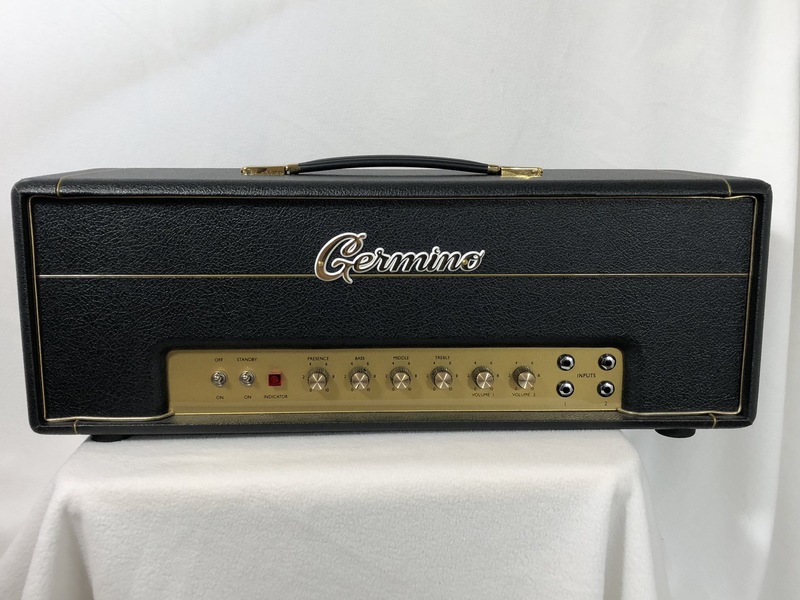 This is as close to a ’50s V/Explorer tone as you will get for under $2k….or even $5k. SUPER light weight at just 6lb-12oz. Almost no wear except super light ‘only noticeable in the light’ type contact & 1 “=” sized surface ding into clear not into wood. I try to give you all the info you need to make an informed confident decision. 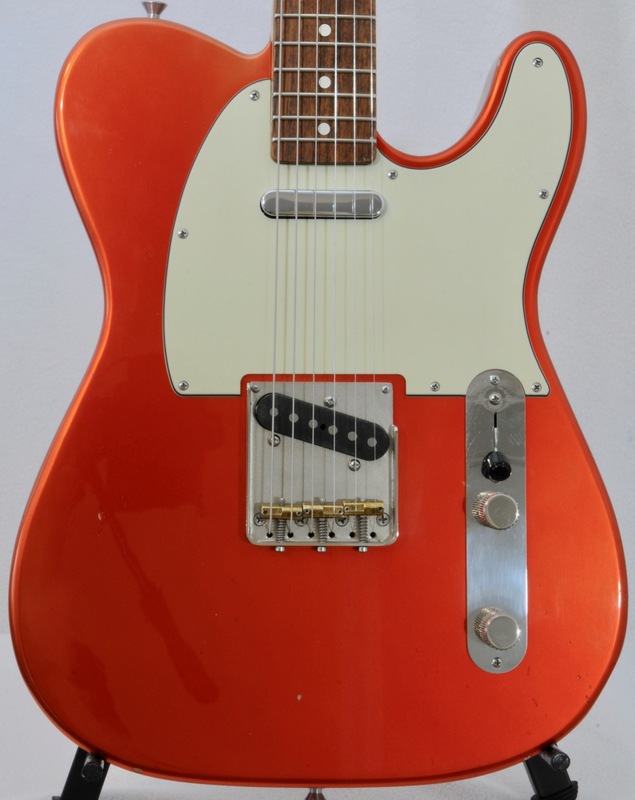 2018 Detemple Tele JUST COMPLETED and owned literally for a couple of weeks by the original buyer; only sold because owner found a rare vintage piece he needed to jump on. Save THOUSANDS from New AND know what this one sounds like. I’ve sold 50 Detemples….they all sound different. Don’t take a shot with this much money..KNOW what it will sound like. I maintain a library of vintage amps to play through so that I can tell you what it will be like vs. other guitars etc. This is a very rare Detemple. First off the weight is just 6lb-8oz. The neck is a wonderful soft V with a profile of .905″-.945″. The FLAME on the neck is freaking WOW. ALSO this is from the Roasted Neck stash that Mikey D just had done. Roasting adds just a slight touch of smoothness to the top end making this latest generation of Detemples that much more special. The neck has a 9.5 Radius and 1-11/16″ Width. Titanium Saddles. Medium Frets. YEs of course it has the original hardshell case. Collings 360 ST Ash with a 1-piece Carved Top Ash Body, FLAME Maple Neck & Rosewood Board. TRULY the LP Lover’s Strat! 1-Owner Near Mint Condition from a Nonsmoking Environment. Comes complete with Unsigned Warranty Card & Americage Custom Hardshell Case. This guitar weighs just 7lb-7oz and features a set neck design. 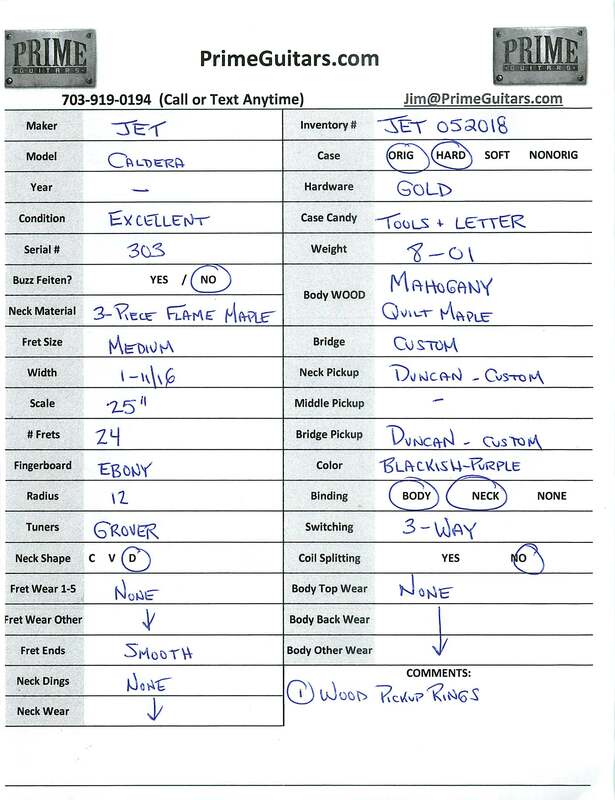 It is 100% Stock so you can find all the specs on the Collings Site (OR LOOK AT MY PICTURES FOR A SPEC/CONDITION SHEET). 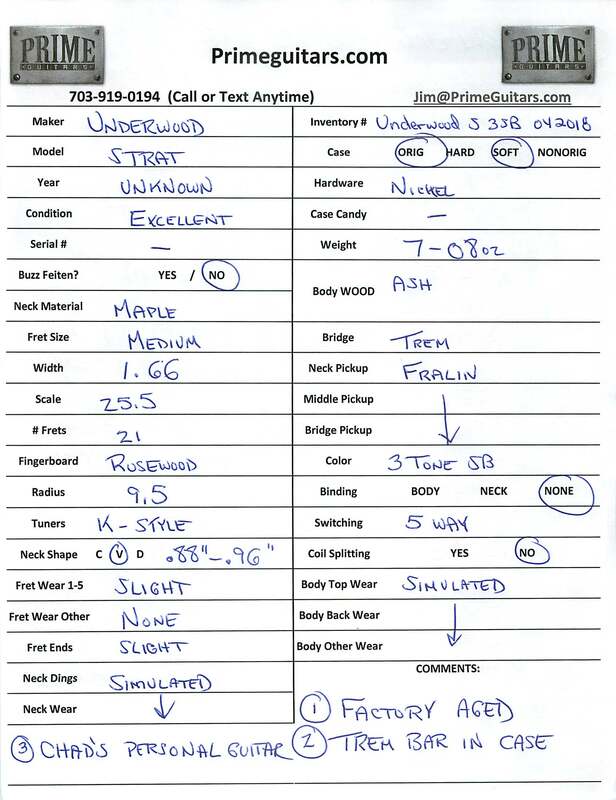 FYI the guitar’s neck has a nice “C” profile with a depth of .86″ – .935″. Hard to find any wear on this but I graded conservatively. Get a fantastic guitar and save via the ‘buyer’s remorse’ discount. 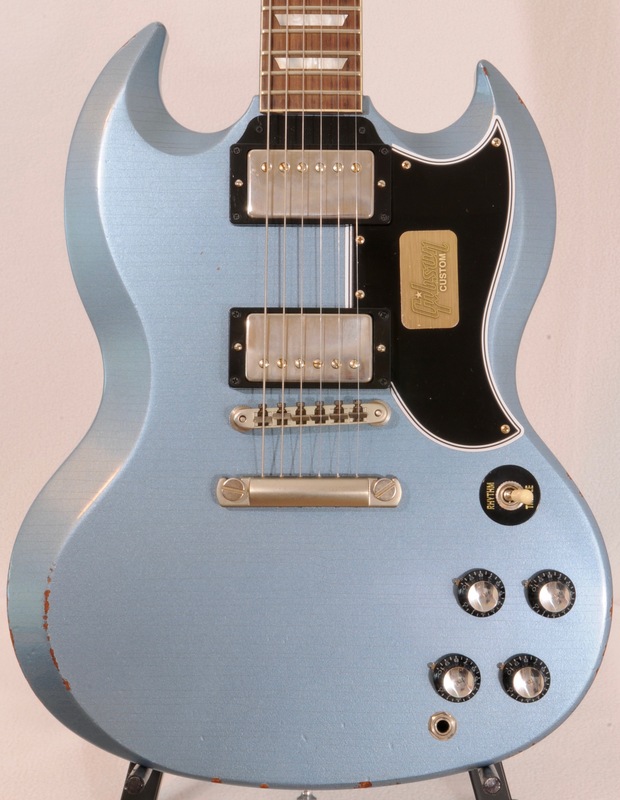 2017 Gibson Custom Shop SG LTD Aged Pehlam Blue Edition! Extremely small run (25 total) done by the Custom Shop. Factory Aged. Probably the best playing Gibson I’ve had in years. I would keep this if I gigged. SUPER easy to play and man does it ring and resonate in my hands. The tones out of this are downright addicting. You can get close to the Tele snap and all the way up to the dark singing neck if you want. Handles vintage and modern amps equally well (i tried it through our library of amps including Vintage High Powered Twin Tweed. 61 AC15, ’67 Plexi, 66 Deluxe and Bogner Uber…oh yeah 72 Hiwatt Combo. LOVES them. LOVES my Klon, TS808, Cornishes and Binson. I was so happy playing it that I put it though my Axe FX and MAN it drove that so well. Really pushes it without overpowering or creating that piezo effect you hear from so many guitars. Hard to find a user-made flaw on this. Don Grosh FULL HOLLOW Set Neck w SPRUCE Top & BRAZ Board ! CUSTOM 1-OFF ALERT! Completely HOLLOW Grosh Set Neck. Hand Carved Spruce Top! 1 Piece Mahogany Back! BRAZILIAN ROSEWOOD BOARD. These guitars are the top of the Grosh food chain. Don himself creates them and an order will take over a year. New they cost mid-$6ks. No two are alike. Having sold dozens of these I can confidently say they represent the BEST value in the used guitar market. Custom YES…someone’s moronic interpretation of beauty?….NO….so capitalize on a guitar built for somone one custom order…someone who spared no expense and got the finest of everything Don could offer….NOT take about 1/2 off…see my point here….OH and it’s near mint..nonsmoking..no issues. These pieces sound so full and clear with nice organic tones. You can dig in or strum lightly. VERY responsive. Aren’t you tired of sifting through mass produced guitars and hoping they sound good? This DOES. 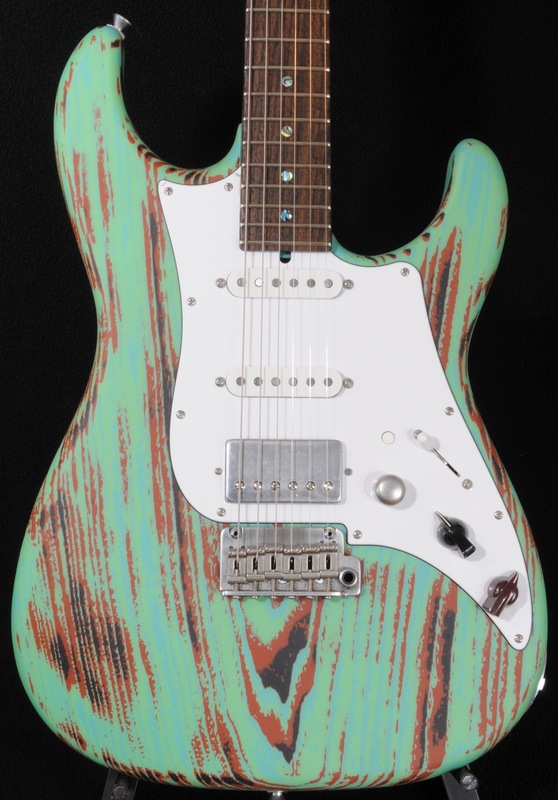 Hall-of-Fame QUILT on this hand crafted Don Grosh Set Neck. YES it has a BRAZILIAN BOARD & CITIES PAPERWORK. 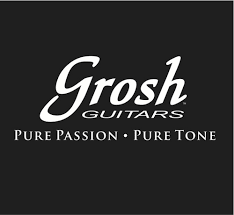 These guitars are the top of the Grosh food chain. Don himself creates them and an order will take over a year. New they cost mid-$6ks. No two are alike. Having sold dozens of these I can confidently say they represent the BEST value in the used guitar market. Custom YES…someone’s moronic interpretation of beauty?….NO….so capitalize on a guitar built for somone one custom order…someone who spared no expense and got the finest of everything Don could offer….NOT take about 1/2 off…see my point here….OH and it’s near mint..nonsmoking..no issues. WOW Guitar Alert! This one could be the Tele-of-The-Year! Hall-of-Fame quality Resonance on this instrument. Just 6lb-10oz. THE STORY is the guitar was made from a stash of 50s Korina that Rick sourced from Gibson. I can’t verify but what I can verify is this is the best sounding Korina Guitar I’ve had. Notes jump off and it has the growl you need in korina. Did I mention it has a 1-piece body…finding this quality and size korina these days is next to impossible. Aged woods? Forget it. The neck is a 1-piece large maple neck with a Maple Board….AND…no cap…meaning it’s all 1 PIECE OF WOOD (no skunk stripe either). 1-11/16″ Width and Medium Frets. 25.5″ Scale and 9.5″ Radius. 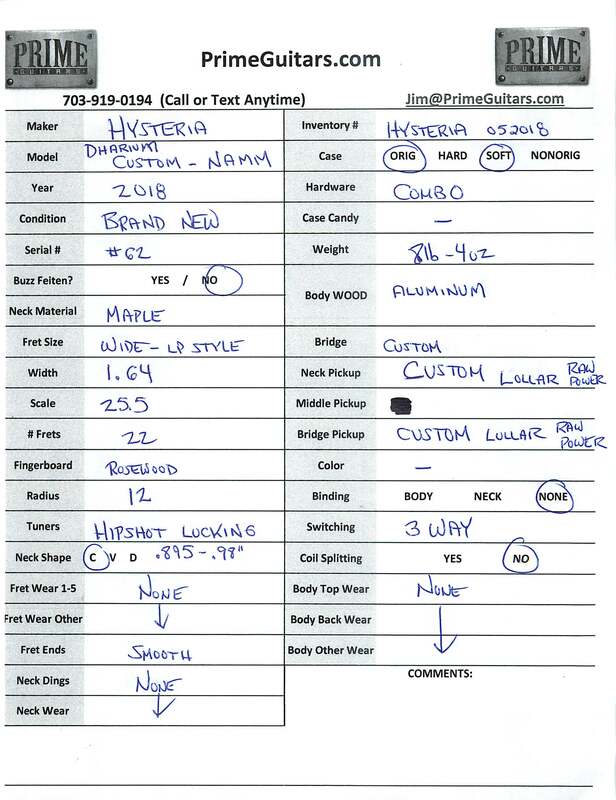 The prior owner believed the pickups are Duncan Antiquities….I am not certain and won’t promise…and no I’m not dissecting the guitar to find out. Glendale T Bridge (the best). Just a COOL piece. LOVES my amps. LOVES pedals. I just want to keep it but it’s your turn to have a great guitar. I have so many. LOOK at the woods on this guitar! 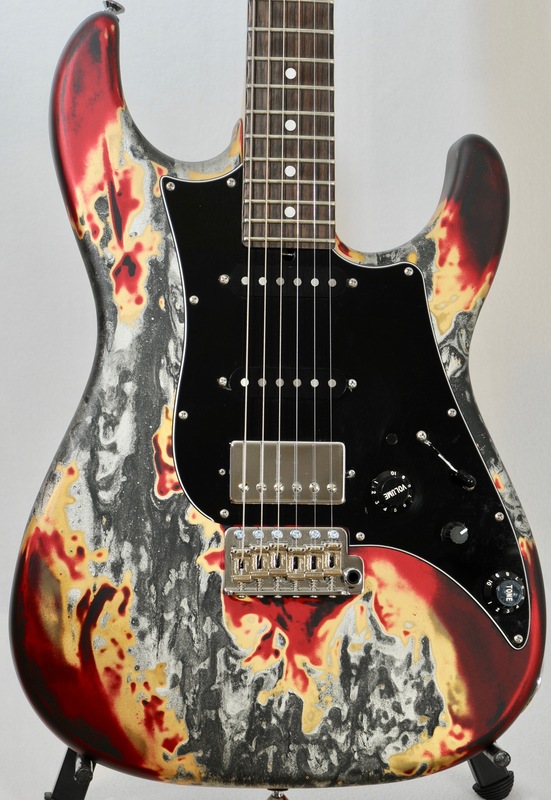 Do you think Wildwood Guitars would have anything be the best come through as a custom run? Do you think Tom Murphy would put his name on crappy guitars? 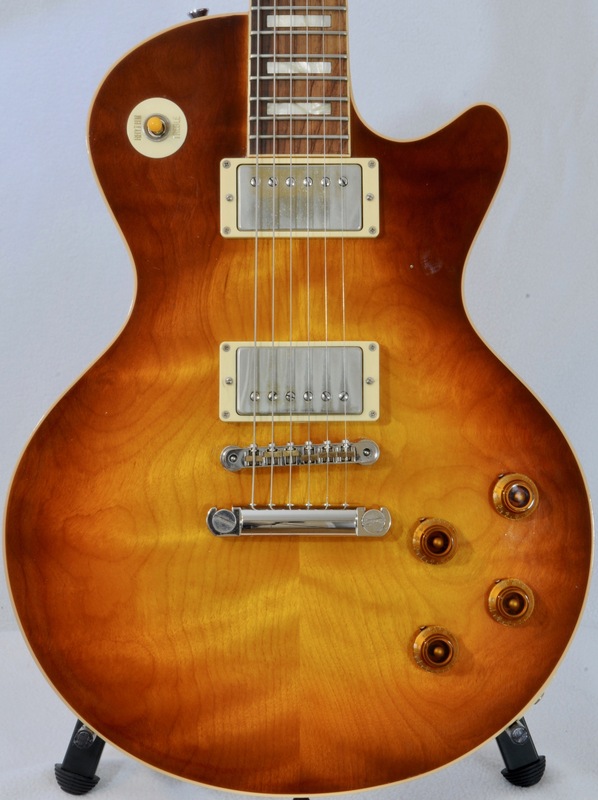 This one is an extremely Limited Edition Gibson Custom Shop 58RI Les Paul. Tom Murphy painted this one. 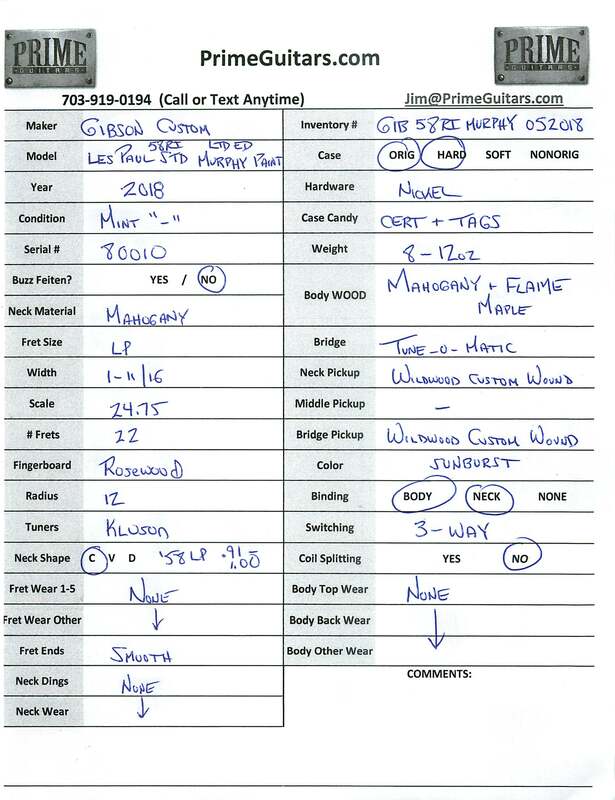 The included Certificate of Authenticity indicates Tom’s involvement. You can instantly see that the color on this Les Paul is much more robust, rich and high end than run of the mill pieces you’ve seen. 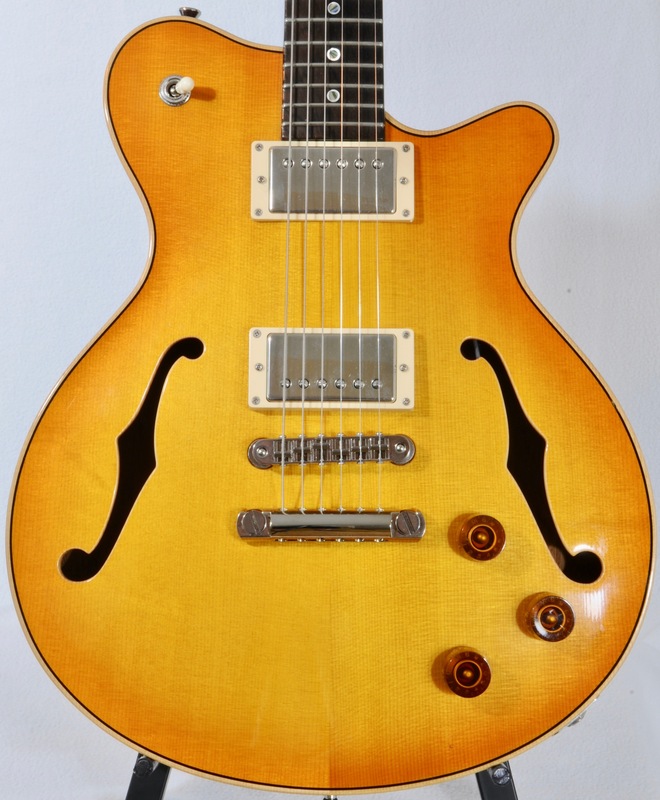 This guitar features a wonderful ‘almost ’59’ profile with a .91″ – 1.00″ depth. The pickups are custom wound Wildwood Custom Humbuckers. The guitar comes (of course) with its original brown form fit case. It is from a 1-owner, nonsmoking environment. There are no stories, repairs or mods associated with this piece. It comes wtih the Cert & Tags. The weight is a wonderful 8-3/4 pounds. There is no fretwear. I can’t find any dings or wear on it. Pretty much what you would expect if you grabbed a guitar off a rack. Save a LOT vs. new and avoid chasing some salesperson who will treat you like he is doing you a favor by speaking with you. Handmade JET Caldera guitar in EXCELLENT Nonsmoking Condition. Every ergonoic detail of this instrument has been painstakingly engineered into a traditional format. The result is a functionally unequalled piece of musical genius. The carved quilted maple top has a classy elegant light finish that allows the guitar to demonstrate quality without it being an ‘Easter Egg”. The finish is a dark blackish-purple. The Neck is 3-piece Flame Maple with an Ebony board. 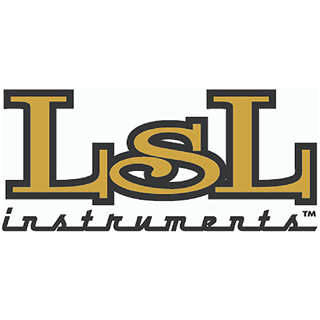 25″ Scale, 12″ Radius, Grover Tuners, 1-11/16″ Width. WOOD Pickup Rings. The weight is a perfect 8lb-01oz. Jet Guitars are coveted by those in the know. NEW these cost almost twice as much as I’m asking. You can see I carry clean well described gear. 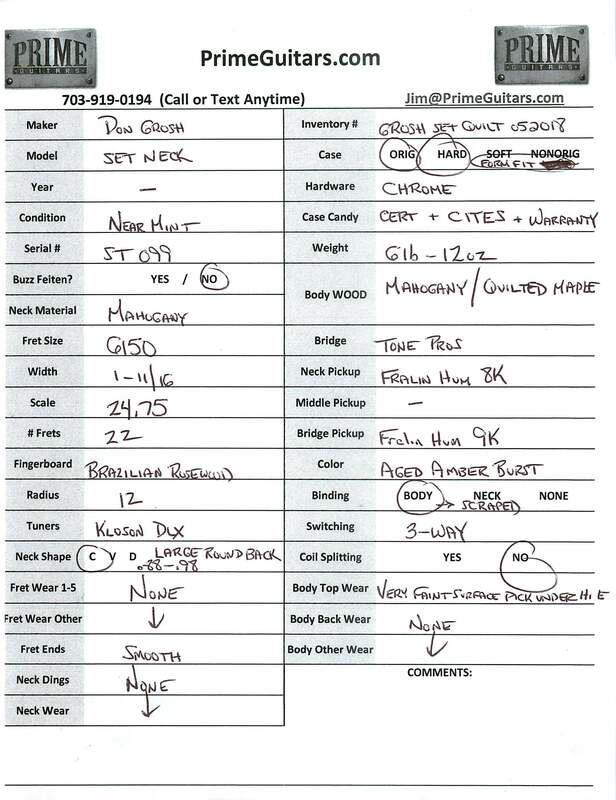 SEE THE PICTURES FOR MY SPEC/CONDITION SHEET with all the details. 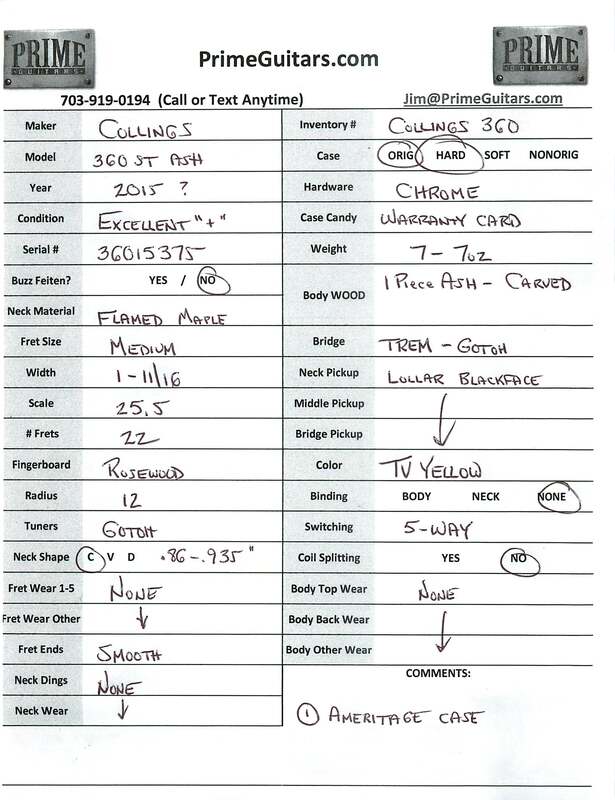 Don’t you wish other dealers would take the time and energy to prepare something this extensive? REVOLT! Scala Guitars are about the most happening brand of boutique instruments. They come up for sale…they sell….simple. THIS is an ULTRA COOL piece LOADED with features. First off check out the solid 1-Piece BOLIVIAN ROSEWOOD NECK! The Fretboard is BRAZILIAN ROSEWOOD! Not impressed? 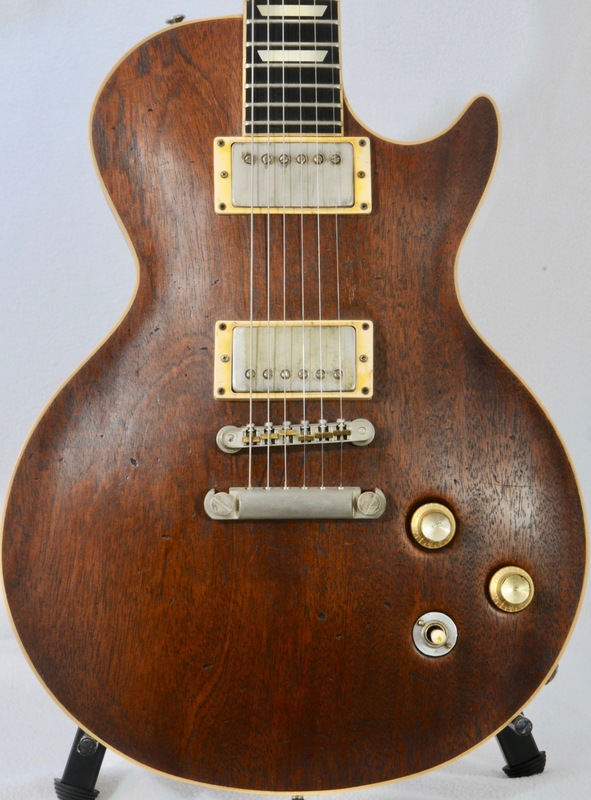 Consider it has a 1-piece HONDURAN (this is the good stuff you can’t get anymore) Mahogany Body. OH, how about a HAND CARVED KOA TOP. To top it off, this is chambered and features Scala’s coveted “Vent Top’. If you look at the guitar straight down (like you’re playing standing up) you can literally see little vents on the side where the top meets the body. The neck profile is a PERFECT Medium “C” that measures .86″ – .91″. The guitar features a gun oil finish that makes it feel like satin. NO thick tone sucking coatings for this guitar. OH did I mention the body is outlined with hand inlaid HERRINBONE? Still want more…you get it….the guitar weighs just 6lb-12oz. OH, it has the original Certificate of Authenticity. The pickups are Lollar P90s. You can see all the rest of the specs in the PICTURES. I outline the CONDITION TOO. 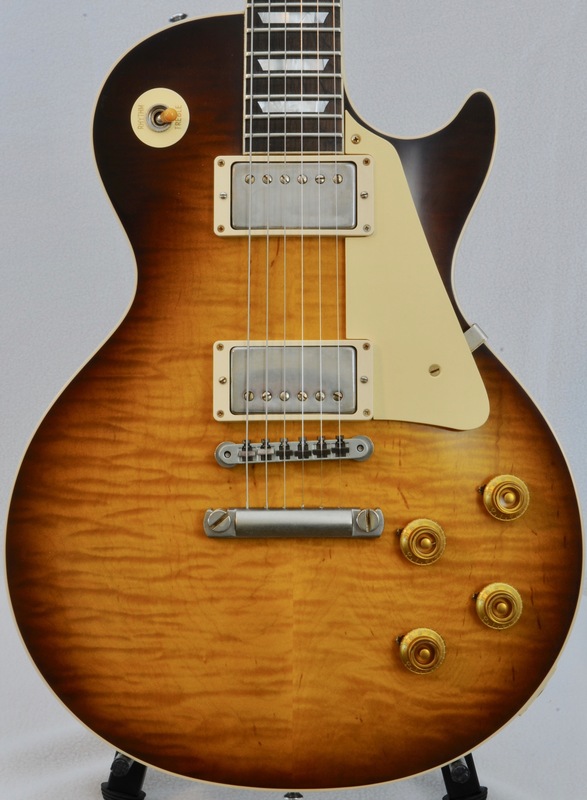 2018 Gibson Custom Shop ’59RI LP CME (Chicago Music Exchange) Limited Edition BRAZILIAN BOARD VOS. WOW…that’s a MOUTHFUL….but THIS IS AN EARFUL of instrument. MAN what a huge difference these 2018s are from prior production runs. The quality oozes and the tone jumps out at you. The weight is a PERFECT 8lb-7oz! This is a 1-owner, babied guitar from a nonsmoking home environment. 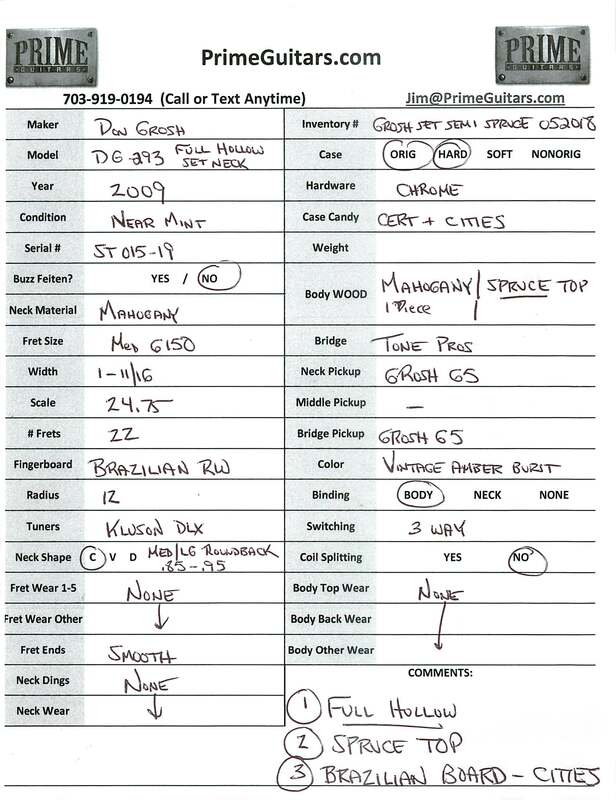 It was owned for a few weeks before the owner encountered unexpected financial obligations. It comes complete with the Certificate of Authenticity and Tags. Beautiful top that I purposely photograph as straight on as possible to give you as conservative a view as possible. Ever wonder why most flames vanish..it’s because the pictures are taken at unrealistic angles to make the nonexistent flame pop. 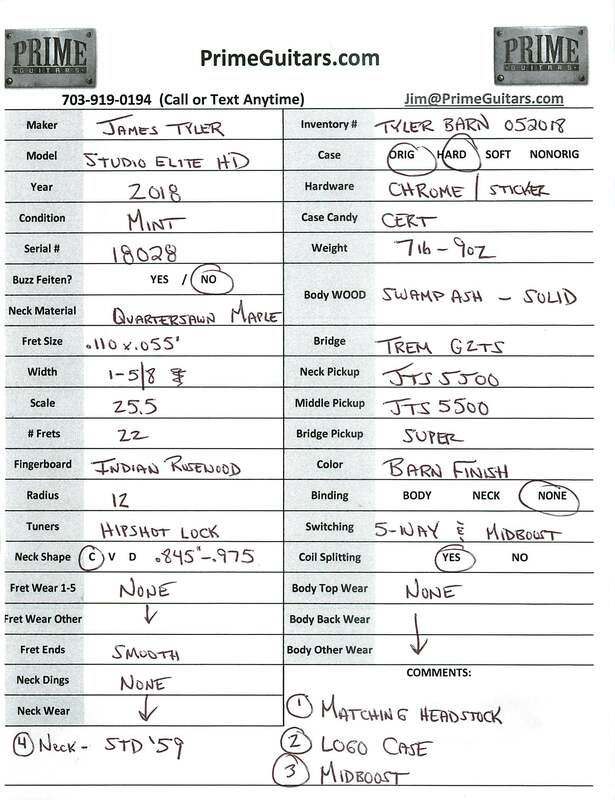 Like New 2018 JAMES TYLER Studio Elite HD in super unique Barn Finish. This nonsmoking 1-owner instrument is rare because it has an Indian Rosewood Board (most I’ve seen are Maple). LOADED with features and oozing with vibe. This one resonates in my hand like a tuning fork. 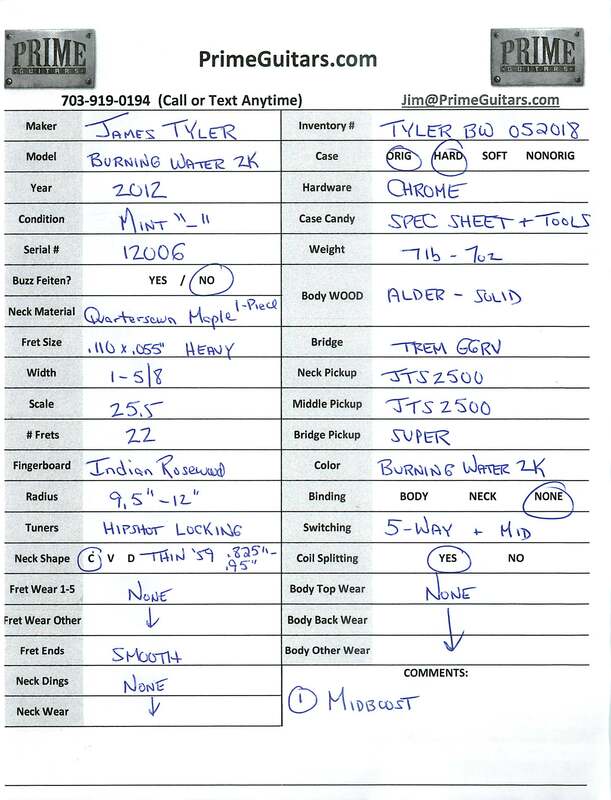 YOU CAN SEE ALL THE SPECS & DETAILED CONDITION IN MY “SPEC SHEET” LOCATED IN THE PICTURES. 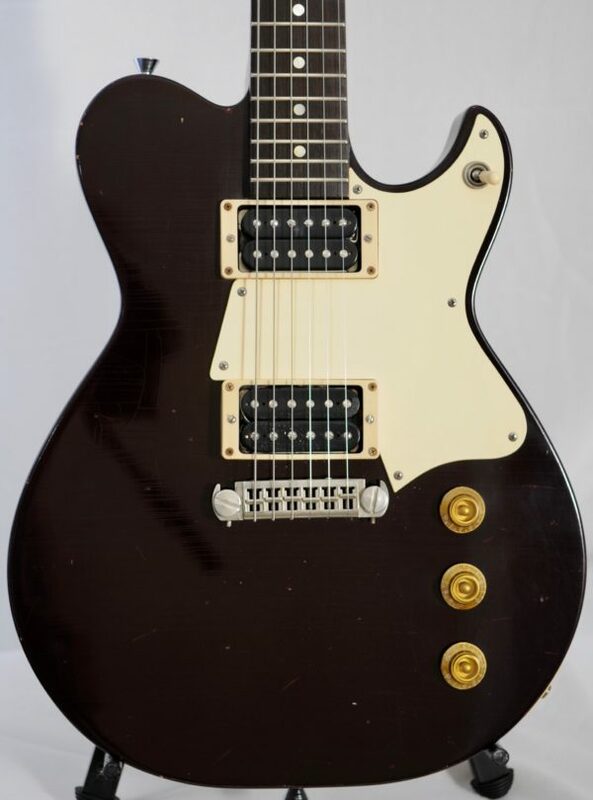 2012 James Tyler BURNING WATER in Mint “-” Condition with Original Hardshell Form Fit Case. This piece comes from a nonsmoking environment and literally smells new. AMAZING instrument with tonal variations galore! Germino Club 40 head with MASTER VOL (on back of head). Excellent non-smoking condition. AMAZING Marshall Tones without the flub or mystery fizz. Greg Germino really figured out how to get the best Marshall tone while improving upon the flaws. I have played this through both my vintage Marshall 4-12 and modern Cabs. I have to say it adapts amazingly to speakers, cabs, guitars and even cables. You can spend $2500 new for this or grab mine that is in Excellent condition…save some dough…and use the savings to tube it up with NOS glass…or buy some fancy cables….or just run out to Five Guys and treat the entire place to burgers.\ Whatever you do…just get this amp because you won’t find a bigger M-style bang for buck at this price point. 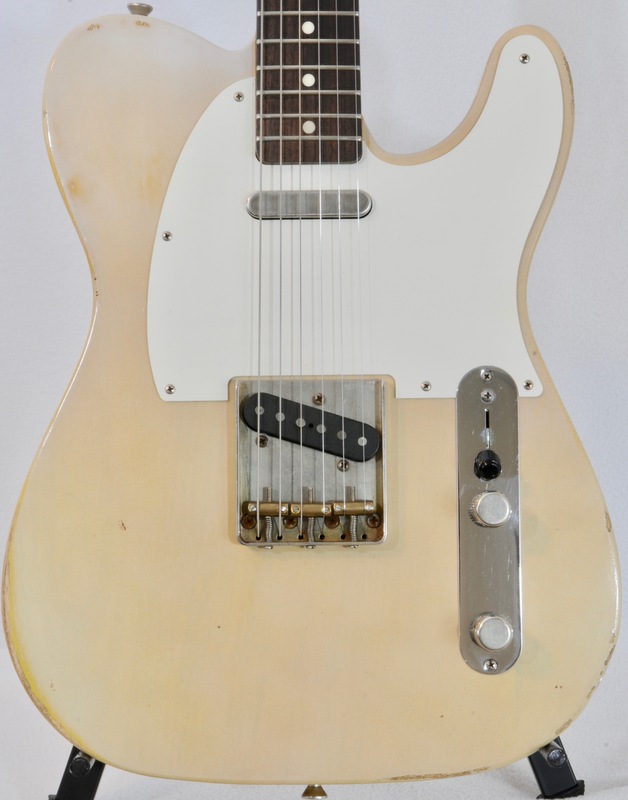 Early Chad Underwood TELE with an F-Headstock (shhhhh). These guitars are the earliest bespoke replicas and they have stood the test of time. 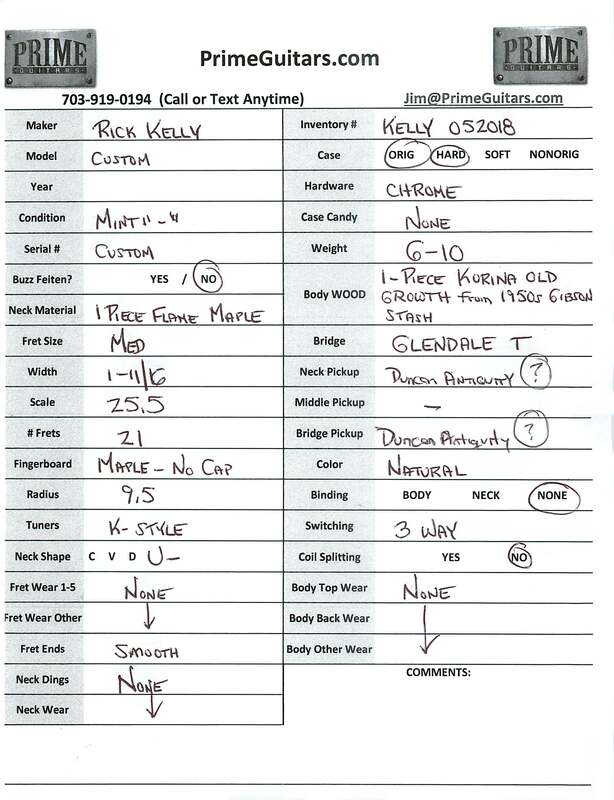 The early ones are the ones that made folks like Paul Reed Smith select them as personal guitars. 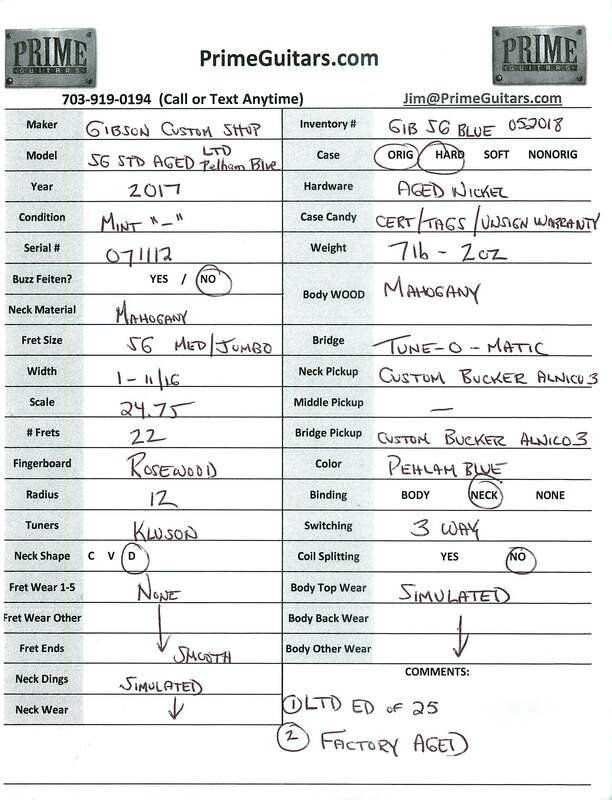 Celebrity name ONLY disclosed to buyer (and not before out of respect). I have not priced this higher for the provenance therefore do not consider it a factor in the sale. Early Chad Underwood STRAT with an F-Headstock (shhhhh). These guitars are the earliest bespoke replicas and they have stood the test of time. 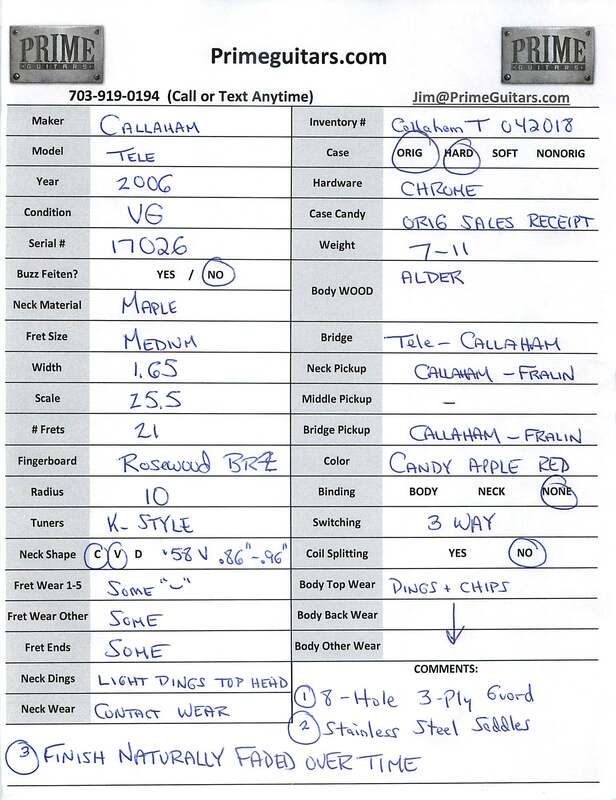 The early ones are the ones that made folks like Paul Reed Smith select them as personal guitars. 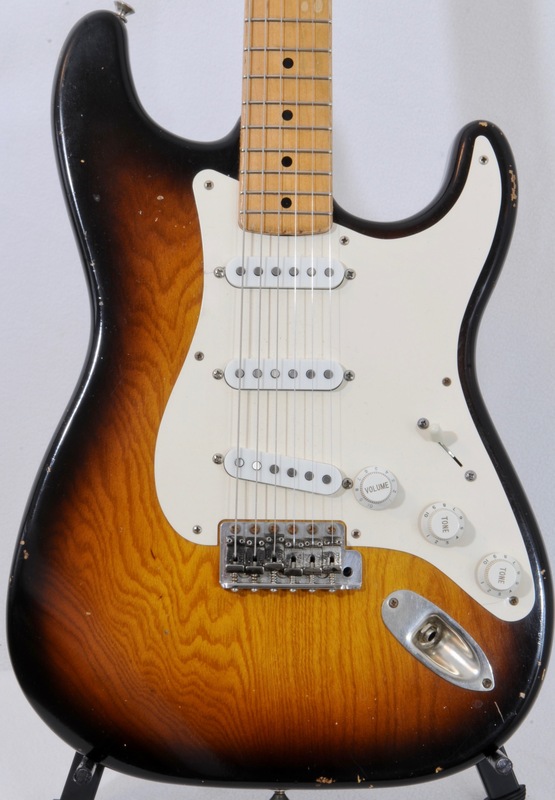 Early Chad Underwood STRAT with an F-Headstock (shhhhh). These guitars are the earliest bespoke replicas and they have stood the test of time. This particular one was Chad’s personal guitar and he sold it to a celebrity with a resume longer than your screen can display; while I do not have provenance of Chad’s ownership, I can tell you it is probably the nicest Underwood I’ve played. 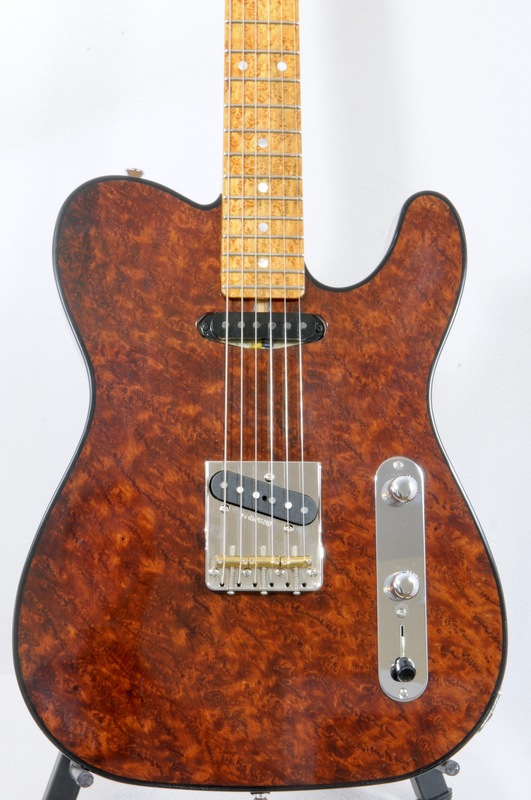 Impossibly Rare Alert: CALLAHAM Tele! This guitar is impossible to find. Even more amazing is that it has a BRAZILIAN ROSEWOOD BOARD. 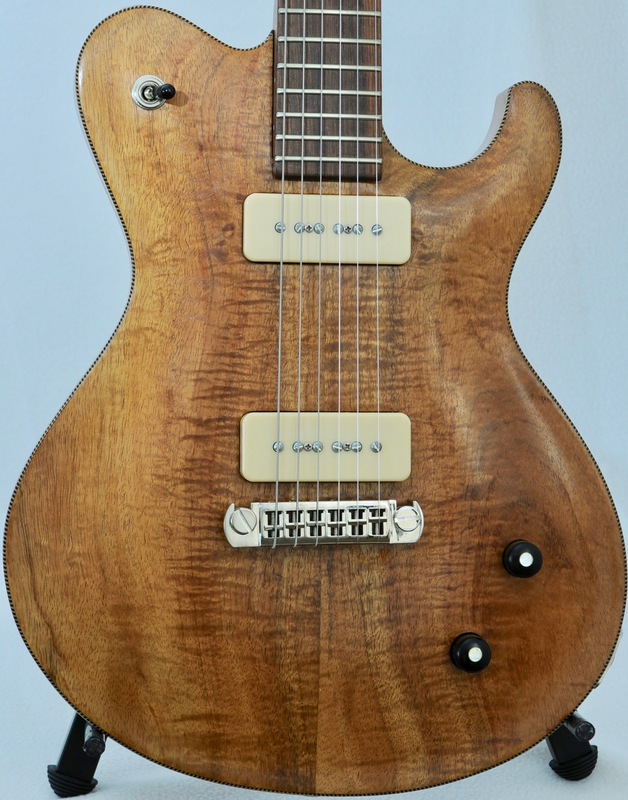 The body is ALDER and the Neck is a perfect ’58 V-to-C measuring a wonderful .86″-.96″. NOT a bat. Just enough meat to help the notes ring out. The color is a Candy Apple Red that has naturally faded over the years. The Callaham (Lindy Fralin custom) pickups are extremely open sounding in this guitar. 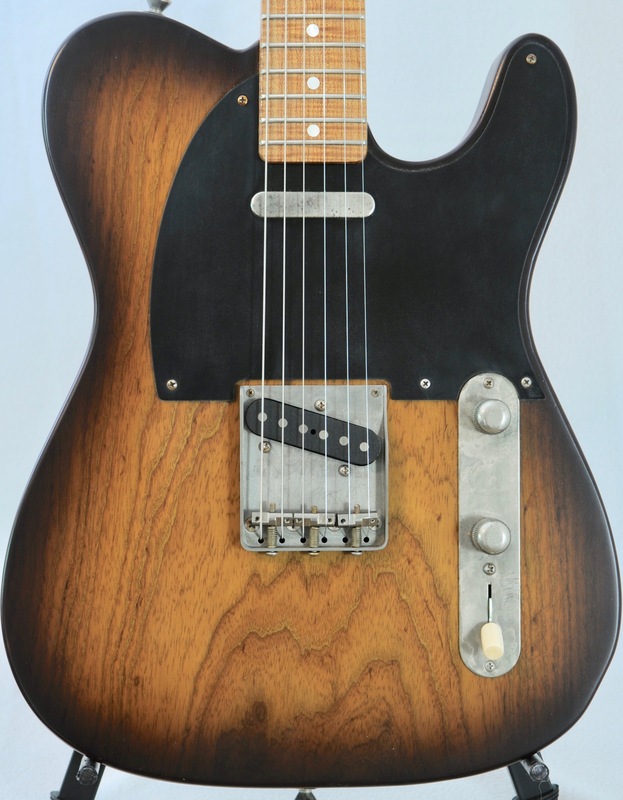 This is NOT a dark, muddy tele. This does Rock-to-Country perfectly. Obviously you can dial back the tone knob to get all the Jazz warmth you desire. This instrument weighs in at just 7-11oz which for a Callaham is featherweight….remember these were made back before every ‘low rent hobbyist’ was asking for weights of pickup screws. Michael Stevens (Co-Founder of the Fender CS) told me the BEST sounding F-style guitars are mid-weight. Here you have one!…and he wasn’t joking. There is some wear on this piece….consider it “naturally relic’d”. 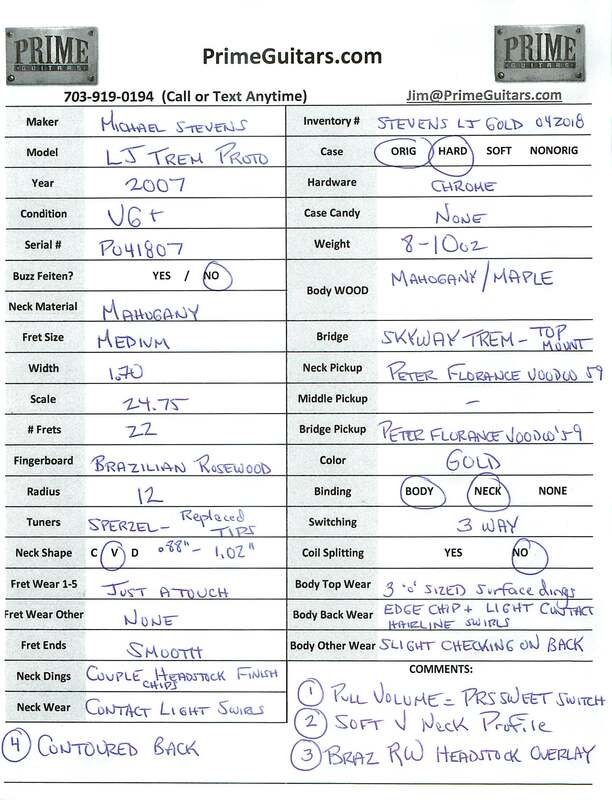 PLEASE SEE 3rd PICTURE FOR A COMPLETE SPEC & CONDITION SHEET. 1-PIece BURLED REDWOOD TOP & BACK w a Swamp Ash 1-Piece Center. 1-Piece EXOTIC BIRDSEYE MAPLE NECK & BOARD. “C” Profile .815″ – .95″ Exotic Neck. One of best fretjobs I have ever encountered. When they say Smooth As Glass…they meant THIS guitar. So let’s get down to it…Builder’s name is Bryan Holloway. For years Bryan has been a major player & builder. Brian works with a major guitar builder and focuses on custom builds for celebs and demanding private clients. His skills have been fine tuned through a friendship & apprenticeship with Larry Wysocki who is one of the most highly regarded builders in the world (Jon Herington of Steely Dan & Steve Kimock of Ratdog to name a few). 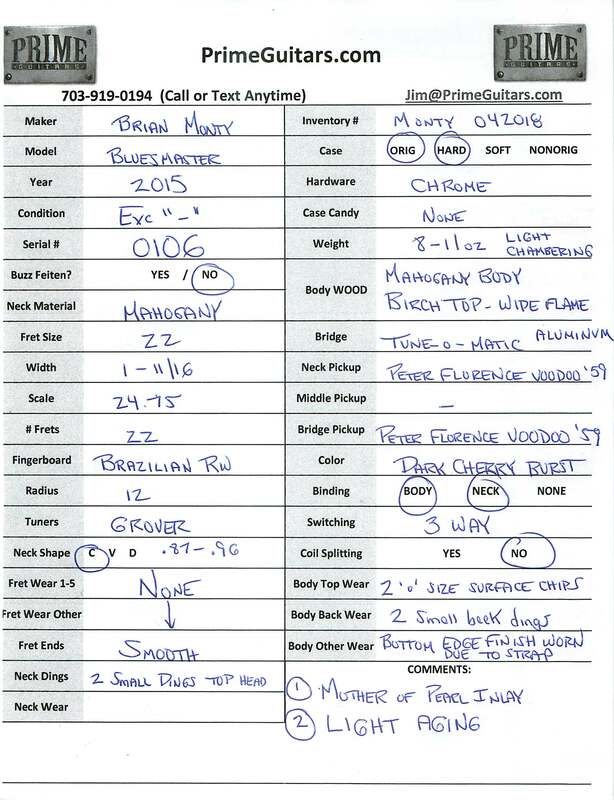 To set the stage, imagine this…Larry Wysocki is THE industry go-to guy when it comes to woods. Larry has been doing this for 50-years and has the most sought after timber in the world. 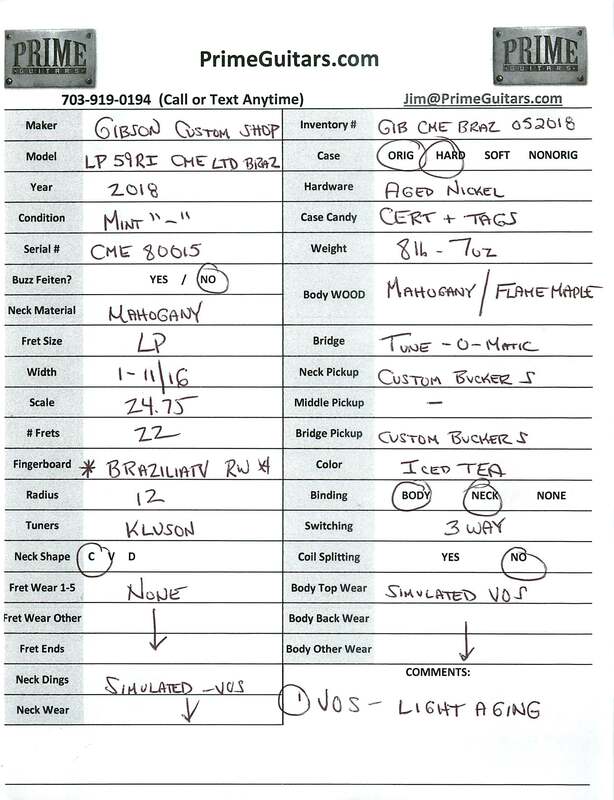 Larry’s guitars are $8k+ and rarely available on the open market. 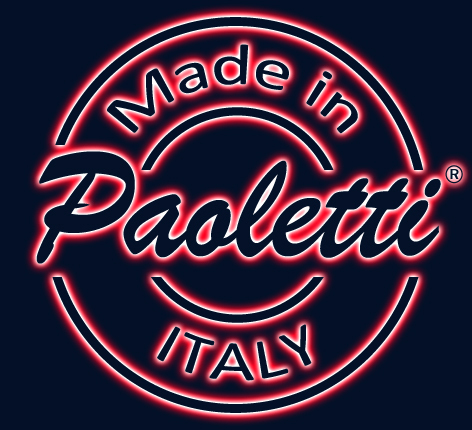 I can tell you that I carry the best handmade boutique guitars currently made. This is in the upper echelon of anything I’ve had. Imagine PLAYING a Bentley automobile. It is beautiful, tastefully elegant but underneath it’s a performance vehicle. You will have a nearly impossible time finding any guitar that is louder or more resonant unplugged. This instrument is alive. 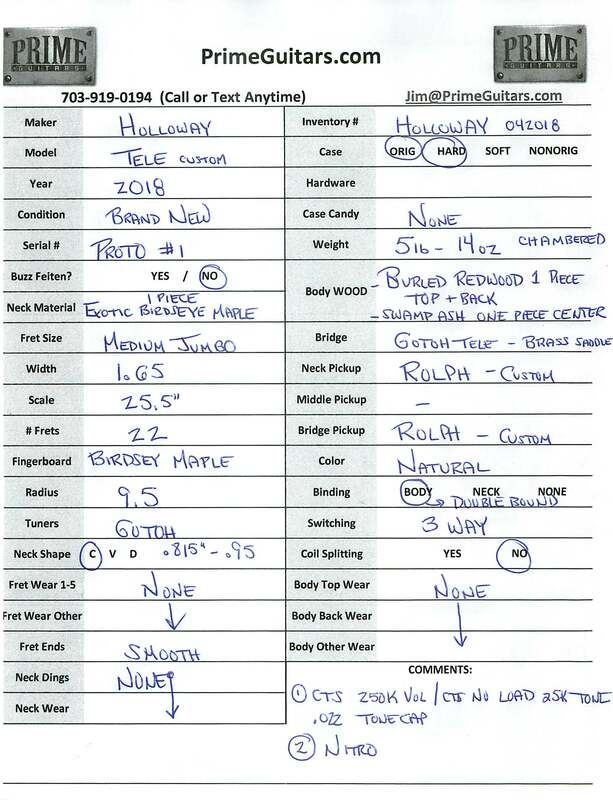 You will not likely EVER AGAIN find a Birdseye Maple Neck/Board this figured. 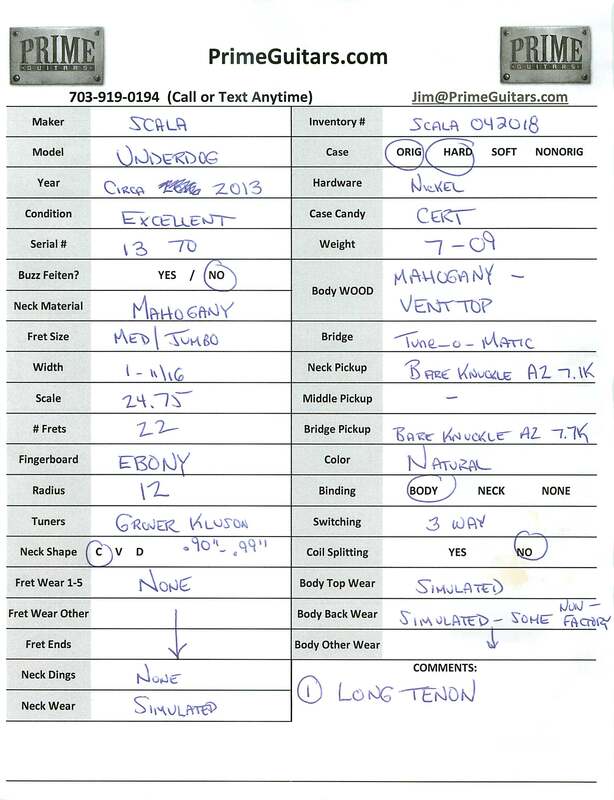 The Redwood…typically only found on $10k Guitars (see the current Suhr stamped out offerings for proof). 2015 Brian Monty “Bluesmaster” in Excellent “-” Condition. This one-owner hand carved masterpiece weighs just 8lb-11oz. 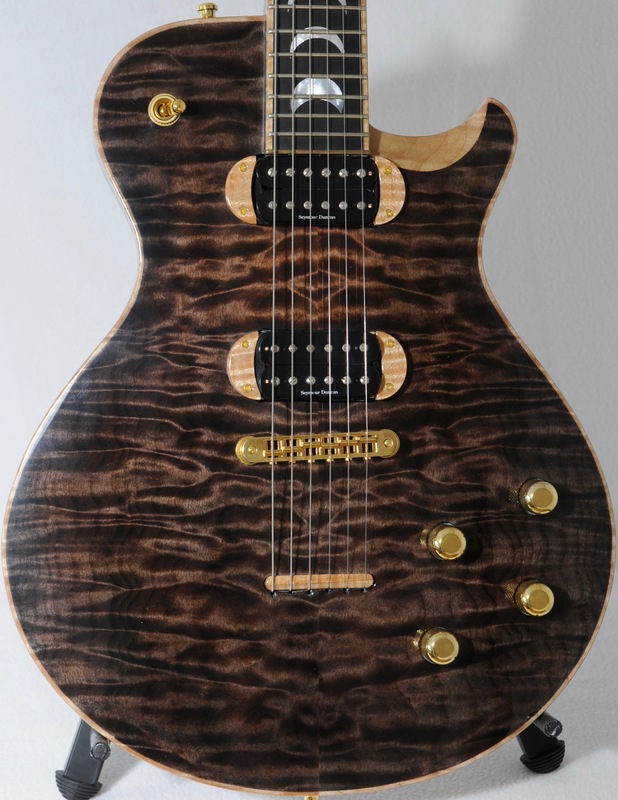 It features a hand carved BIRCH TOP & Hand shaped Mahogany Body & Neck. Check out the grain on the BRAZILIAN ROSEWOOD BOARD. The neck profile is a wonderful “C” that measures .87″-.96″. 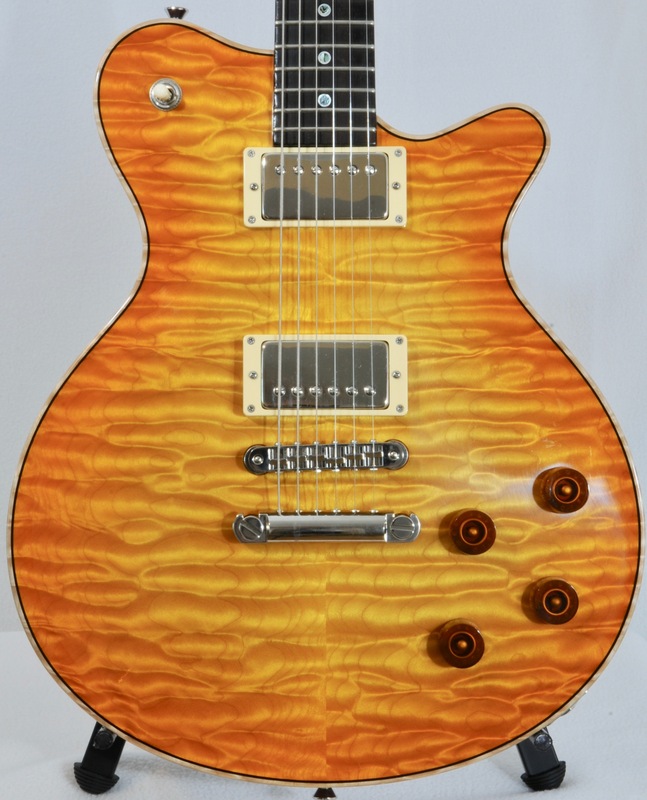 The frets are typical LP style and the scale/width and such are typical LP. The pickups are Peter Florence Voodoo ’59s (non splitting) which I happen to love because of how open they sound. The guitar features very light aging and a hand sprayed Dark Cherry finish in thin NITRO. There is some prior-owner wear on the instrument most notably some finish edge wear on one edge due to a strap contact point. 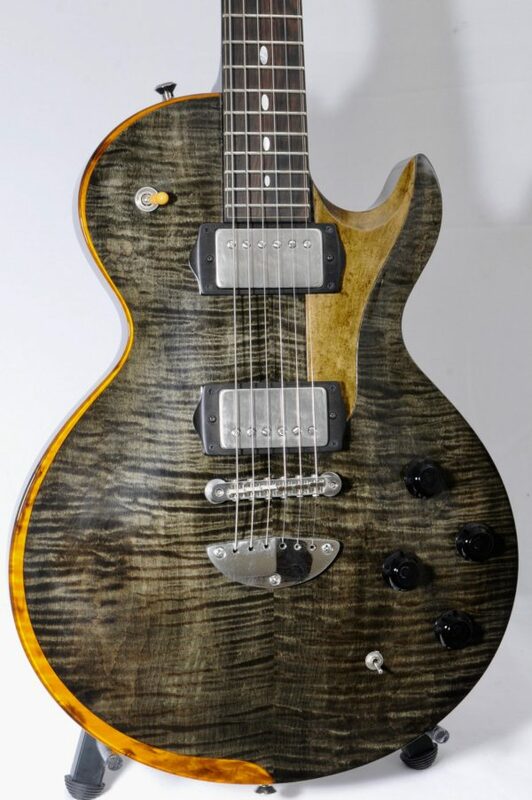 If you have experienced Brian Monty’s work you know you just can’t touch this kind of quality and craftsmanship in a GIbson at any price…let alone this price. New, these guitars are bargains…USED they are absolute MUST tries. What we have here is one of the single best guitars I’ve owned (of the thousands). 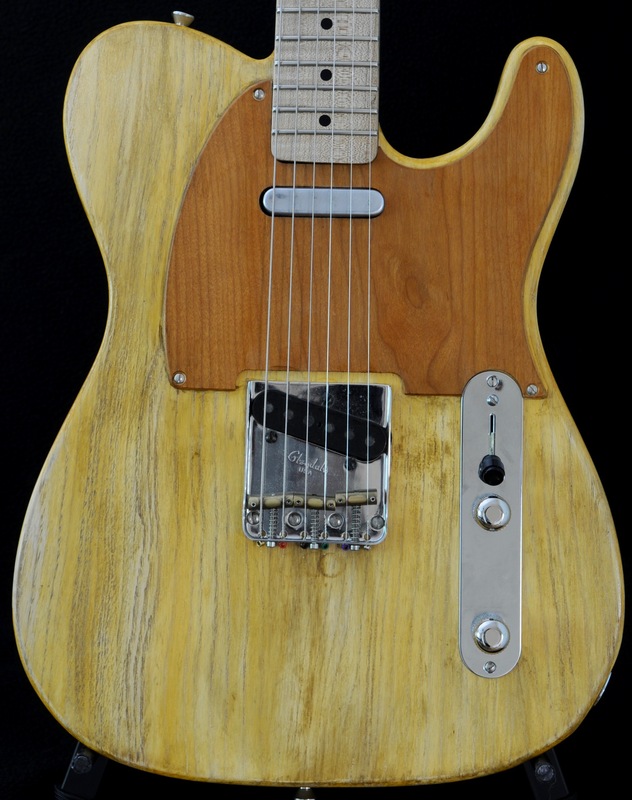 It was made FOR me in 2007 by Michael Stevens (founder of Fender Custom Shop) in his TX workshop. It is a Prototype for a singlecut trem model. It is absolutely the most musical sounding singlecut I’ve played. 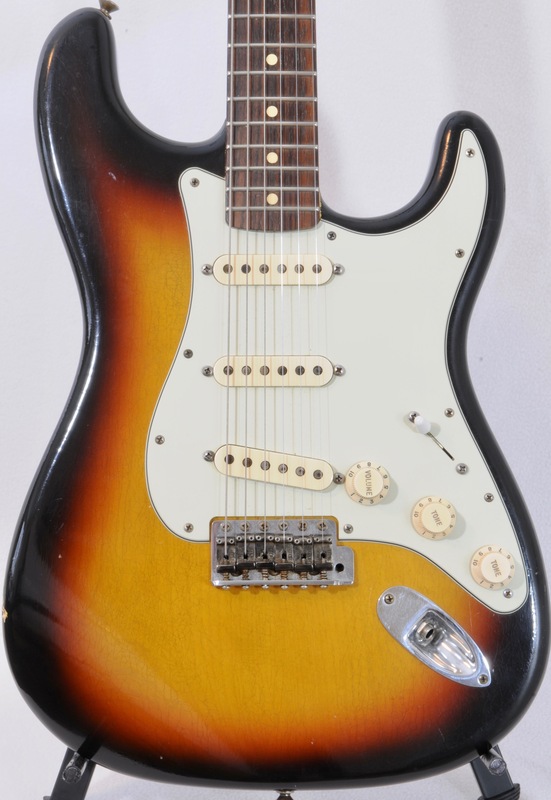 This guitar is not to be confused with the team built ‘Fender’ production models that came much earlier. This is a true MICHAEL piece. For those who follow at home, I’ve sold 28 Stevens guitars. 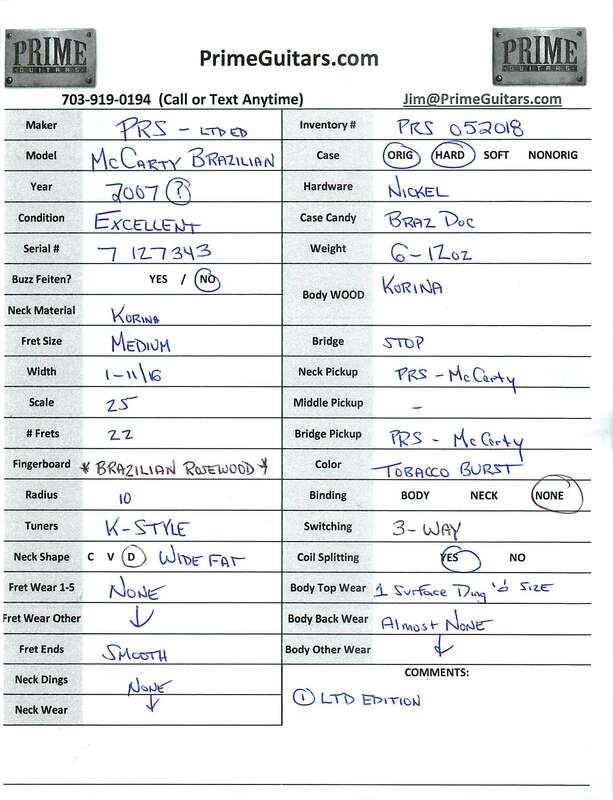 I have vast experience with them and can help you determine if the tonal aspects of this one meet your needs. I can tell you these others won’t hit the market anytime soon and are typically locked away in collections (I put them there..I know). This is a unique opportunity to get one at a discount vs. the price new. Again, this is hand crafted with hand shaped Honduran Mahogany Soft V Neck with a .88-1.02″ Depth. Just look at the perfect TV finish on the back of this guitar. Michael did this himself..it’s not outsourced like so many other ‘builders’. 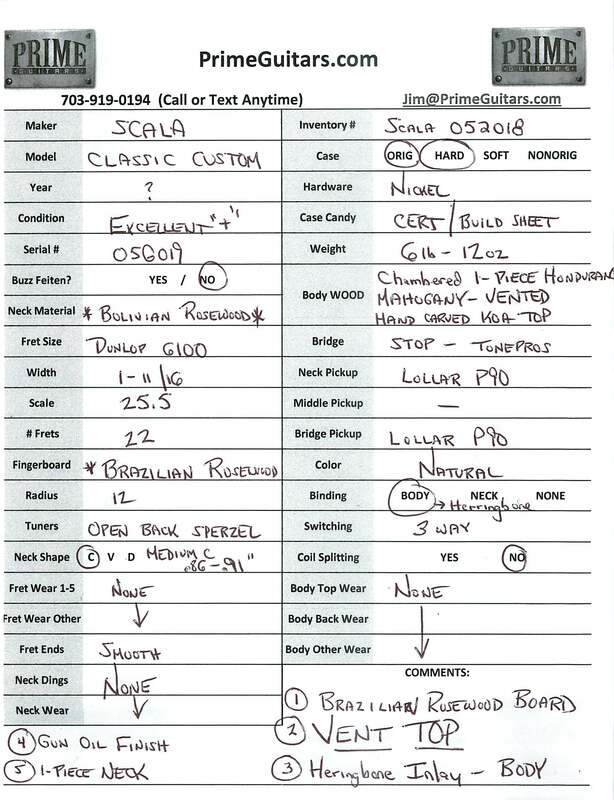 The board is a beautiful Brazilian Rosewood...again this is good wood not some leftovers that pass as BRW. The headstock overlay is also Brazilian Rosewood. The back of the guitar has a wonderful body contour that makes playing the instrument SO easy sitting or standing. Speaking of comfort, this one weighs in at a perfect 8lb-10oz. This masterpiece is a tyipical LP Scale. The frets are a tallish-medium size & the neck is 1.70″ in Width. 12″ Radius and Sperzel Locking Tuners (replaced tips). The pickups are not original, I replaced the Lollars with Peter Florence Voodoo 59s (Non-splitting) because I find them more open and clear. 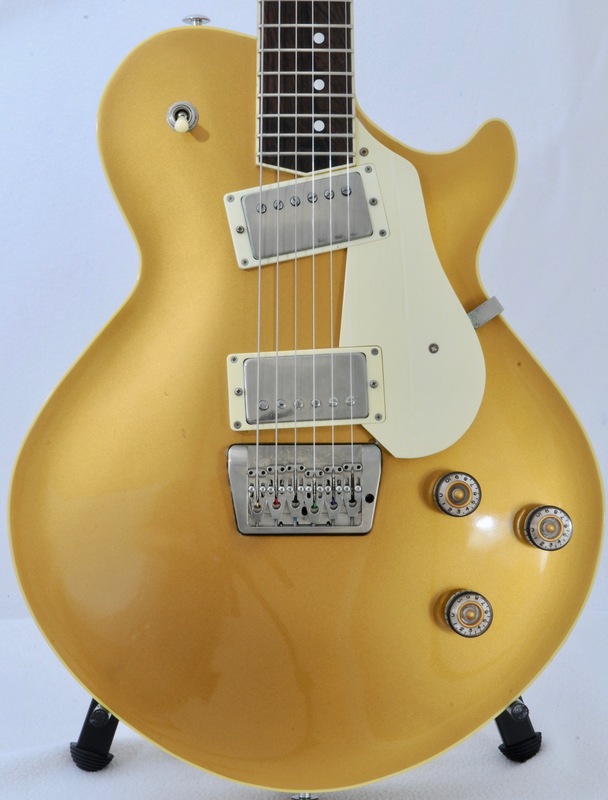 Of course the guitar is hand finished in a vintage GOLDTOP with fantastic binding and hand painted knobs. I had Michael add a PRS Sweet Switch to the volume (pull to engage) to add a touch of warmth when needed. I love this mod feature. Speaking of features, let’s discuss the Trem. It’s called a Skyway. Why did I select it?….simple. It is TOP MOUNTED. Look at the back of the guitar…no wood is missing. Just a touch of wood needs to be removed from the top in order to fit a guitar with one of these. NO spring noise. ALSO, it feels and acts like a fixed bridge. THE most comfortable bridge to rest your palm on…hands down. If you are not a trem guy…no issue…it won’t come into play. If you ARE a trem guy then a SKYWAY is SMOOTH and even. It’s not clunky and choppy. You can bend down and slightly up with ease and precision. VERY innovative and many of the major boutique builders used them at one point before they became impossible to procure. You can see the conditiion is VG+ with just touches of wear here and there. The guitar comes complete with the original hardshell case. It has lived in nonsmoking environments. YOU CAN SEE A DETAILED CONDITION REPORT IN THE PICTURES. 2013 Scala Underdog “Vent Top” with Bare Knuckles Pickups! This handcrafted masterpiece features a unique top venting that allows the organic tone to resonate and mix. Tiny little ‘vents’ are created along the top edge where the top fits into the body. The result is a LP with the effect of a 20%-ES335 tone added. VERY Unique. These guitars have SOUL and STLE. It features a Long Tenon neck joint to create the utmost in resonance and string energy transfer. It weights in at just 7lb-9oz. 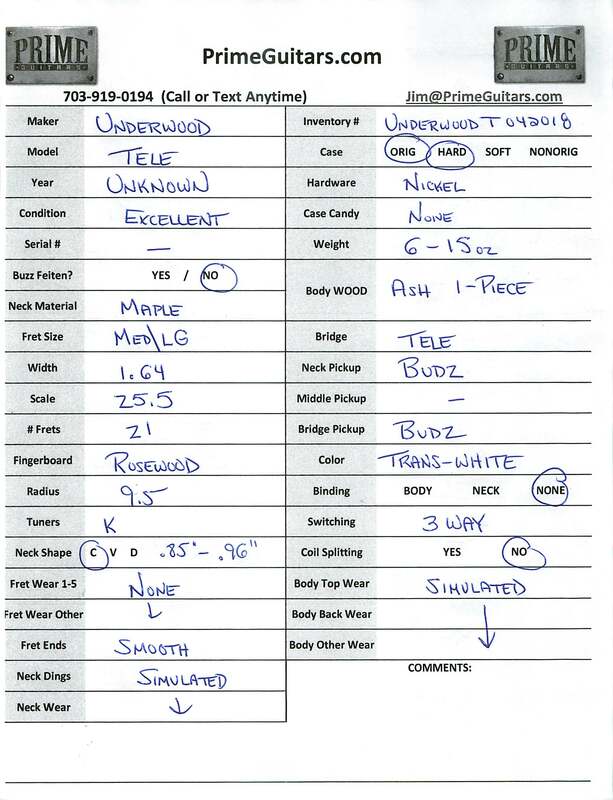 The neck is a perfect (for me anyway) “C” profile with .90-.99″ Measurements. Of couse it comes with its OHSC & Certificate of Authenticity. Nonsmoking prior home. 1-11/16 Nut & Med/Jumbo Frets. 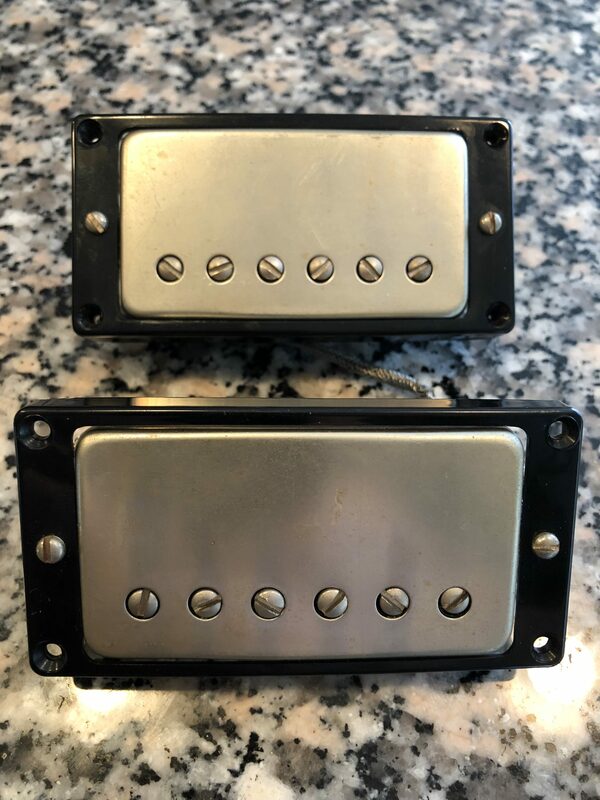 Pair of TIMBUCKERS (Tim White) humbuckers. Impossibly rare. Rare set with covers. Not certain what the coil colors are and not going to take covers off to find out so consider it a mystery that only you can solve! These are out of production. They won’t last long so grab them for your stash. Work as they should. I will not triple box and seal with non-GMO glue because once upon a time you had an issue with some hot sauce you got from Uganda. Sakashta “Smoky Signal” Tubeless OD pedal & original box! This is the EL84 version. I’ve had all 3 versions and kept this because it adds clarity and a touch of high end; I found the other two versions were slightly darker tonally…this worked MUCH better with my Marshalls. I’ve literally had many hundreds of pedals through my store. I always try them out because it’s a blast. I maintain a library of old amps & guitars to test things with. I can tell you I have 3 OD pedals (this is the 3rd)….Klon, TS808 and this. This gets you from gritty to punchy. The dial on the left side of the pedal is the most useful of almost any dial on any pedal. It is almost like focusing a lens on a camera. The knob allows you to dial in just the right amount of grit vs. od. Think of it like perfectly biasing a tube amp or intonating a guitar. It isn’t so much a gain knob as it is a continuum of power tube distortion to preamp. I have to say if I used pedals I’d keep this. I just don’t use them because I play at home and have tonal variation through the amps. I keep the Klon & TS808 because customers ask me to test gear using them. I have never seen another. This pedal is worth the price. You have had flavors of OD….get what feels like ‘the great translator” pedal.